Take note, I’m writing for silicon.com now! It’s true, my Computing blog is still there on the website. But take a closer look. I have not updated it since March 22 this year. All my writing on sourcing, globalisation, and the ‘who moved my job?’ theme is now going into a weekly silicon.com column. So that’s where all my tech services work will be printed. I’ve been writing my Talking Outsourcing blog in Computing for four years now. It’s grown into one of the most popular blogs on the magazine and even spawned a book-of-the-blog. Some of you might remember the book launch talk I gave last October where I changed shirt about five times while still speaking. It made a change from the regular talks on outsourcing. But I’ve written over 450 blogs on outsourcing for Computing now and it’s time for a new challenge, so you will soon be able to see me publishing a video (and text) blog on sourcing and globalisation in silicon.com as well as my recently launched SocialITe blog on enterprise social media in Computer Weekly. It’s sad to let the Computing blog go, but it’s time to move on to do something new and possibly a little more visual – that is, if you can cope with my mug on camera. Take a look here for a comment on video. I will see you commenting on the new blogs soon I hope… or chatting on my Twitter. Blogging is a very direct medium. In my case, I find ideas and stories work better if I can publish them quickly and then take ideas or thoughts from others out there in the online community. This immediacy means I can get ideas and comment out to people within minutes. For example, I was at IBM this morning listening to a speech by Lord Mandelson and blogging it live as he was speaking. The policy advisor sitting next to me from the department for Business, Innovation, and Skills probably thought I was being incredibly rude by typing during the speech, but these are new times for information. I was getting feedback on the speech before Mandelson had even walked off stage. However, this immediacy and the fact that this is a written form of communication, means that tone and meaning can sometimes be lost – opinion or humour can be mistaken for flippancy. I’ve heard it through the grapevine that my last blog entry here, the one about teaching for London South Bank University on Sunday morning, has not gone down too well with some of the university staff. I’ve not heard from anyone directly, but the impression I got was that my blog post was viewed as a very negative perspective on the MBA residential weekend. But, let’s have a look at the blog post and see what could be misunderstood? I said that I had not been able to do a lot of advance planning because I could not access the LSBU team. That’s not a big issue. It’s just that I had wanted to explore some ideas around my presentation, but it’s not as if I need much help preparing to present on a subject I know well. The issues were mainly personal anyway so I’m not complaining here, merely observing that I’d really like to explore some ideas next year with the team. It’s hard as a visiting lecturer – I’m not on campus all that often. Maybe I should pop in for lunch more often. It was genuinely nice to speak and then to find that the students were keen to keep on asking questions, and several mentioned that they would have liked my talk earlier in the weekend so they could keep talking to me for longer afterwards. I thought that this was a very positive statement. I’m only joking about them all being hungover. Sure, some of them were probably hungover after having a few drinks on Saturday night, but everyone was in there on time and really engaged with my session, and Leslie’s before mine. The comment on Twitter is just linked to the earlier comment. I’d like to explore some ideas around interactive lectures that can draw ideas from the students or connect them in new ways. I don’t think it’s offensive to suggest an exploration of innovative case studies or student networking. The final comment was really just a passing joke on the students and their Saturday night party. I was not even there, but I thought the play on the MBA acronym was amusing – I never made this up, I merely passed it on and several people I know got in touch with me to say they thought this was amusing. I really love my role as a visiting lecturer at LSBU. I’ve been regularly contributing to the MBA and MSc International Management for about six years now. I’m not full time. I visit and do my thing, hopefully offering a view from outside the campus, and I really enjoy being able to meet the students and to interact with them. Working with post-graduate MBA students is not like working with undergraduates. The students have all worked, and they are mostly giving up time from their career to take the MBA (or trying to cope with studies and work together). They come from all over the world, and they have many different views and opinions that I also learn from and enjoy. I regularly speak at conferences and events all over the world and at these talks, and in all my books, I always mention that I’m a visiting lecturer at LSBU because it’s something I’m really proud of. The weekend residential sessions are a really valuable opportunity to focus a lot of time with the students and the staff that I don’t meet all that often. I think the sessions at places like Latimer house are really excellent and benefit both students and staff alike by allowing everyone to escape the regular campus structure for a few days. I usually come and stay on site for these weekends, but this year I had too many deadlines, with a book that needed to be approved for printing. I spent all day Saturday checking and working on this book, so I had to just drive in on Sunday to do my talk and return home again. It was a shame as I missed a lot of the usual weekend interaction, but then it could not be avoided. I’m looking forward to getting back into LSBU for my next lecture. Possibly around my new work on enterprise social media… watch this blog for news of my new magazine column and book all around this theme. It was nice to chat with the new chief editor of Computer Weekly, Bryan Glick. Of course I worked with Bryan when he was editor of Computing, and he only just left so in the past couple of weeks I have seen him at a big awards function for Computing, then Computer Weekly. I was shortlisted for the best analyst or consultant blog. Unfortunately I didn’t win, but then again I had no real expectations of winning because I never ran a big online campaign asking people to vote for me. I just didn’t have the time as I only found out I was shortlisted quite close to the closing date for voting – I found out because I went to vote and saw my own name on the shortlist! Still, it’s great to get shortlisted for a national blogging award. It’s certainly a recognition that the approach I take on the Talking Outsourcing blog works for a lot of people. Let’s face it; there are a lot of very dry and boring newsletters and blogs on sourcing. Either they are dominated by contract wins or sales speak. I think my more personal approach to a business blog strikes a chord with a lot of people. It was fun to meet some people I only know from Twitter – and to recognise them in person from a memory of their profile photo – like Dr Black from Westminster University, and some of the Computer Weekly team. I also got to chat with the marketing team from CapGemini, who I usually only ever talk to on Twitter. There was a funny moment during the awards presentation. The award for best blog on the environment went to Greenbang. I sent a text immediately after the announcement to Greenbang founder, Dan Ilett asking why he was not at the function. He called me within seconds to explain that he had to attend a family funeral. I was standing next to Bryan Glick so I passed him the phone… the awards were still being handed out and Dan was listening to the editor congratulating him from the event just seconds after he had won. And Dan really couldn’t believe he had won so it was really nice to get him on the phone like that. Thanks to everyone who voted for me anyway, and especially to whoever nominated me to be featured in the awards in the first place. I didn’t self-nominate so someone out there thinks the blog is worthy at least! I’m shortlisted in the Computer Weekly IT Blog Awards 2009. The party and presentations take place tonight at Shoreditch house. I’m in the shortlist for my Talking Outsourcing blog in the best analyst or consultant category. If you are going to be there then please do say hello. If you are not going to be there then say hello on Twitter… if you include the hashtag #ITBlogs in your Twitter messages then they will visible for all to see at the awards party tonight… they have Twitterwalls at the event showing all the online chat about the awards! Vote for me in the Computer Weekly awards! I’m shortlisted for an award in the annual Computer Weekly blogging awards. 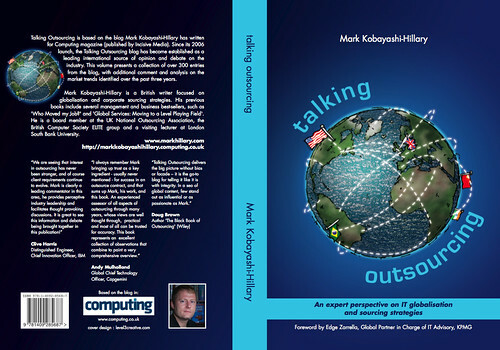 It’s for the best analyst or consultant blog, for the Talking Outsourcing blog I write in Computing magazine. It’s nice to see it shortlisted as Computing is the arch-rival of Computer Weekly – and quite appropriately, the editor of Computing leaves the magazine tomorrow to become the new boss at Computer Weekly. Can he get the staff over there to vote for me perhaps?